She is Chair and Chief Executive Officer of Hills & Company. Ambassador Hills served as U.S. Trade Representative (1989-93) in the Bush (41) Administration and Secretary of Housing and Urban Development and Assistant Attorney General, Civil Division, U.S. Department of Justice, in the Ford Administration. Over the years, Ambassador Hills has served on a number of publicly traded corporate boards and currently sits on one. She also serves on a number of not-for-profit boards including as Chair of the National Committee on U.S.-China Relations and of the Inter-American Dialogue; Co-Chair of the Council on Foreign Relations; member of the Executive Committee for the Peterson Institute for International Economics and of the Trilateral Commission. Before entering government, Ambassador Hills co-founded and was a partner in a major Los Angeles law firm. She received her bachelor’s degree from Stanford University, her law degree from Yale University, and studied at Oxford. She holds a number of honorary degrees, and in 2000, she was awarded the Aztec Eagle, the highest honor given by the Mexican government to a non-citizen. The former Chairman of the U.S.-China Economic and Security Review Commission, a congressionally appointed group that advises congress on U.S.-China policy including national security and trade issues. Daniel Slane was reappointed to the Commission by Speaker of the House John Boehner for a third two-year term expiring on December 31, 2013. Commissioner Slane is the founder and co-owner of the Slane Company, whose principal business includes real estate development, lumber, and furniture. He has extensive international business experience, including operating a business in China. Commissioner Slane became a member of the board of trustees of The Ohio State University and was chairman from 2005 to 2006. The Ohio State University is the nation’s largest university, with an annual budget of over $4 billion. Victor Zhikai Gao is Executive Director of the Beijing Private Equity Association. He was recently elected as the first Secretary-General of the China Private Equity Association, the principal self-governing body for the private equity industry in China. He has extensive working experience in investment banking and corporate management, including positions with Morgan Stanley and its joint venture, China International Capital Corporation. He also served in a variety of senior management positions with the Chinese National Offshore Oil Company (CNOOC). He has served with the Chinese Foreign Service in Beijing and at the United Nations, and was an English interpreter for the late Deng Xiaoping. In 1999 and 2000, he was the China policy advisor with the Hong Kong Securities and Futures Commission. Gao received a bachelor's degree from Soochow University (Taiwan), a master's degree from Yale University and a J.D. from Yale Law School. 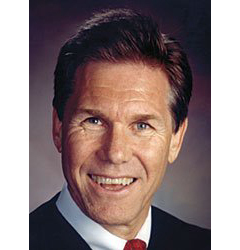 Chief Judge Rader, Randall R.
RANDALL R. RADER was appointed to the United States Court of Appeals for the Federal Circuit by President George H. W. Bush in 1990 and assumed the duties of Chief Judge on June 1, 2010. He was appointed to the United States Claims Court (now the U. S. Court of Federal Claims) by President Ronald W. Reagan in 1988. Chief Judge Rader's most prized title may well be "Professor Rader." As Professor, Chief Judge Rader has taught courses on patent law and other advanced intellectual property courses at The George Washington University Law School,University of Virginia School of Law, Georgetown University Law Center, the Munich Intellectual Property Law Center, and other university programs in Tokyo, Taipei, New Delhi, and Beijing. Due to the size and diversity of his classes, Chief Judge Rader may have taught patent law to more students than anyone else. Chief Judge Rader has received many awards, including the Sedona Lifetime Achievement Award for Intellectual Property Law, 2009; Distinguished Teaching Awards from George Washington University Law School, 2003 and 2008 (by election of the students); the Jefferson Medal from the New Jersey Intellectual Property Law Association, 2003 and many more honors. Disclaimer: Our confirm speakers list may change due to unforeseen circumstances.